Japanese Kendō has its foundation in the ancient sword techniques. Metallurgy, for the first time, came to Japan from China in the 3rd century BC, at the beginning of the Yayoi period. Swords were commonly used by warriors of ancient armies. Two are the terms which were commonly used to describe these objects: Katana and Tsurugi. Both to indicate a sword, but of different form: Katana was used to describe a one-edge sword, while Tsurugi was used for the double edged ones. Japanese sword (Nihon-to), as intended today, can be traced back to the middle of Heian period (794 -1185 AD). In the Japanese Middle Age many were the weapons used by the warriors' class in battles, as bows and halberds; but the sword held an important symbolic role and warriors used to tribute it great respect. Fire weapons were introduced in Japan, for the first time, in 1543 by Portuguese merchants. The art of war was so deeply revolutionized that, soon, everyone realized that bows and arrows could not hold up the confrontation. Despite that, however, Japanese considered fire weapons nothing but mere instruments, never recognising them the sacredness and spirituality acknowledged to swords. They were not considered the most important weapons to hold on the side and warriors ended up dismissing fire weapons in the first time of modern era. For the Samurai the fight was not simply killing the enemy, but it was a dimension in which, trained warriors, fighting each other, could win the fear of death fighting in the correct manner and following established rules. When shotguns were discarded, the weapon elevated to the main side weapon was the sword that, during Edo period (1603 – 1868 AD), held a central role in martial arts. Even though the first period of modern era was a peaceful one, the sword held its practical quality and increased its value as a mental and spiritual symbol. Already at the time of Samurai the sword training was not performed with a katana; in order to avoid injuries and being able to train in the most realistic way as possible wooden swords were introduced. Specific protections, different from the ones used in battle, were invented for the purpose. This equipment, even though maintaining the original setting, was modified throughout the years, until they got to the current bamboo sword used in Kendō (Shinai) and to current protections (Bogu). From historical references result that modern Kendō, intended as practice of the use of the sword with Shinai and Bogu, was widespread already at the beginning of the 18th century, even though its basic techniques were already taught several centuries before. After World War II Kendō was forbidden all over Japan from the American occupation government, even though it kept on being taught in secret form. Kendō was officially reintroduced from 1952. After the re-introduction the most martial characteristics and some harsher peculiarities typical of pre war period were eliminated. However, even though the exterior aspect and some of the ideals have been changed due to changing needs of the society, Kendō keeps on insisting on the strengthening of the character, self-discipline and respect. Nowadays Kendō keeps on prospering under the guidance of the Japanese Federation (All Japan Kendō Federation) and of the Federations form all around the world. 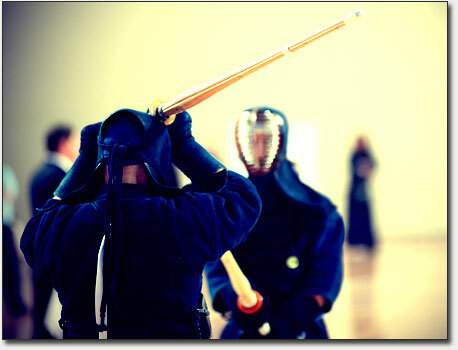 In Italy the federation of reference is Confederatione Italiana Kendō (see the official website at www.cik-kendo.it). In the picture above: archive image, Kendoka in action.